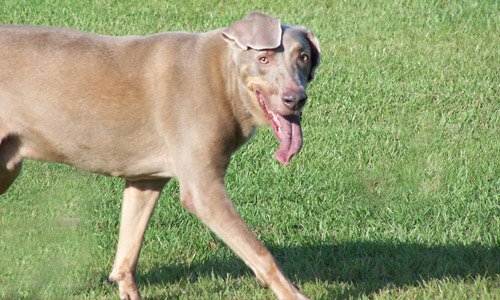 Elmo came to us from Weimaraner rescue. His original owners had a baby and he became jealous and started nipping. That behavior led to him being dropped off at the local humane society. The staff there called Weimaraner Rescue, who came and got him and learned he was heartworm positive. They treated the heartworm but found Elmo difficult to place, so they brought him here to live out his life with us. Everyone here loves Elmo, he is just a big, floppy, boney boy who loves to play and get belly rubs.